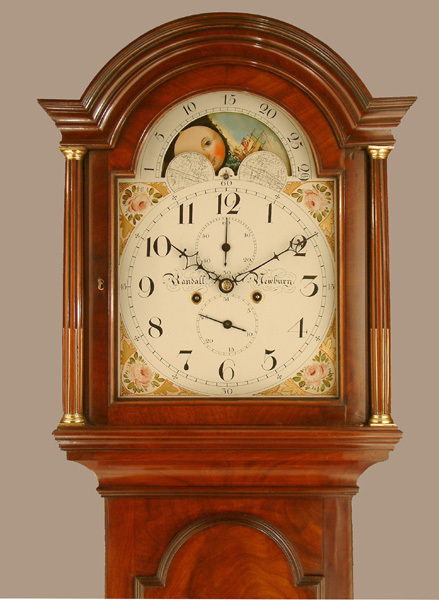 This Longcase Mahogany Archive's Maker - Randall ( William ) of Newbury recorded as a clock and watchmaker 1795 - 1812. Recorded "made church clock with Cummings escapement". Also known for world time clocks and clocks with unusual features. Well proportioned, long door, figured/flame mahogany case with breakarch top of small, neat size and good colour. 12" breakarch painted dial by Finnemore ( recorded 1812 and later ) with roses painted to corner spandrels, Arabic numerals, subsidiary date and seconds dials. Good quality 4 pillar 8 day movement with hourly ( rack ) striking. 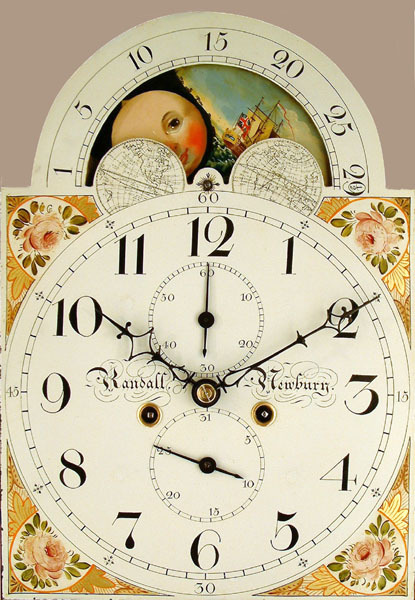 Randall ( William ) of Newbury recorded as a clock and watchmaker 1795 - 1812. Recorded "made church clock with Cummings escapement". Also known for world time clocks and clocks with unusual features.